Brisbane’s very own globe-trotting show is back and touring Australia, slap bang in the middle of another world tour that’s taking in 20 countries, major arts festivals and an ongoing residency in London’s West End. Internationally acclaimed by audiences and critics alike, it comes to Drayton following a much-praised season at Melbourne International Comedy Festival. This pitch perfect tribute to Fawlty Towers starts as the audience waits to be seated then hurtles along for two hours of fully immersive, highly improvised and site-specific comedy theatre. With only a third of the show scripted, everything stays fresh as Basil, Sybil and Manuel serve up some madcap mayhem and a three-course meal – with the audience playing the part of their restaurant diners. Do expect all the best gags and ‘a rip-roaringly hilarious night out’ (This Is London) – just don’t expect a herd of giant wildebeest, and certainly don’t mention the war! 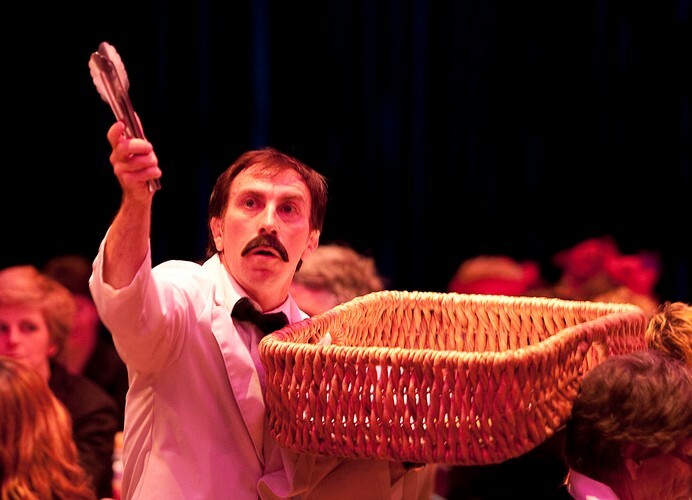 Faulty Towers The Dining Experience was born in Brisbane in 1997 and made its international debut in 2008 at the Edinburgh Fringe, where it’s sold out every year since. Last year it opened a residency in London’s West End, where it continues throughout 2013. Six teams of cast now tour the world non-stop; the cast at The Grange features Karen Hamilton as Sybil, Ron Kelly as Basil, and Andy Foreman as Manuel. Andy is one of the company's co-founders, and Karen is one of the company's longest-standing actors. For show info, including cast detail please visit the Interactive Theatre website above. Tickets include a 3 course meal and 2 hour interactive show.